Once upon a time, a man was driving to an important meeting. He had to use an unfamiliar rural road to get to this meeting, and he was beginning to feel frustrated because he was in danger of being late. He came upon an unexpected road sign. It said “Danger, Bridge Out Ahead.” Wooden barriers were on the road, but there was room to drive around them. What should he do? He could ignore the signs and forge ahead, or he could turn around and find another route to his meeting. From where he was sitting, he couldn’t see a washed-out bridge. The signs looked official, though, so there probably really was a dangerous dead-end road ahead. The smart thing for him to do is obvious. Going ahead would at the very least, make him even later to his meeting. Worse, he could drive off a cliff, kill himself, and never get to the meeting. Here is an interesting question. Was the person who put up that road sign loving or hateful? Your answer depends on whether you have faith in the one who put it up. If the danger is real, placing the “Bridge Out” sign is a helpful and loving thing to do. If the danger is NOT real, that sign is unhelpful, and maybe even cruel. Let’s apply that idea to the many ominous warnings that are found in the Bible. Here are some brief examples. Paul warned us that those who refuse the message of Christ are headed for destruction (Philippians 3:18-19). We are all born slaves of sin “… resulting in death…” (Romans 6:16). “For the mind set on [sinful desires] is death…” (Romans 8:6). “Then when lust has conceived, it gives birth to sin; and when sin is accomplished, it brings forth death” (James 1:15). According to the Merriam-Webster dictionary, the word “killjoy” refers to the “one who spoils the pleasure of others.” Maybe you see God as a killjoy. His warnings annoy you. As far as you are concerned, all those “Thou shalt not’s” in the Bible interfere with what little pleasure you’re trying to squeeze out of this life. King Solomon, one of the richest men who ever lived, decided to go down the road of worldly pleasure, but he found that it only led to a dead-end of despair and unhappiness. “I said to myself, ‘Come now, I will test you with pleasure. So, enjoy yourself.’ And behold, it too was futility. I said of laughter, ‘It is madness,’ and of pleasure, ‘What does it accomplish?’ “(Ecclesiastes 2:1–2). Later he said that seeking the world’s pleasure “was vanity and striving after wind” (Ecclesiastes 2:10-11). What do you think? Are the Bible’s warnings rooted in love or are they an unnecessary burden? 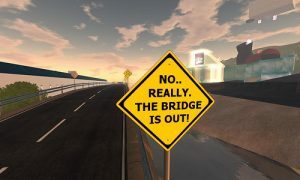 How you feel about them is like the “Bridge Out” sign. It all depends on whether the warnings are true or not. After all, we can all agree that a few moments of pleasure aren’t worth an eternity of pain. Sin does have its pleasures, but all this world can offer are “… the passing pleasures of sin” (Hebrews 11:25). On the other hand, God offers pleasure that will never end: “… In Your presence is fullness of joy; In Your right hand there are pleasures forever” (Psalm 16:11). I’m so glad you have read this far because I have some really good news. God doesn’t want to keep you from pleasure. He wants to change what brings you pleasure. Once you fall in love with Jesus, you can “Delight yourself in the Lord; and He will give you the desires of your heart” (Psalm 37:4). “He will fulfill the desire of those who fear Him; He will also hear their cry and will save them” (Psalm 145:19). Jesus Himself declared “These things I have spoken to you so that My joy may be in you, and that your joy may be made full” (John 15:11). It is God’s amazing love that prompts Him to warn us that the bridge ahead of us is out. The road of sinful pleasure leads to a disastrous dead-end, but following Christ means we can “Rejoice in the Lord always; again, I will say, rejoice!” (Philippians 4:4). P.S. It doesn’t matter how far you’ve gone down the wrong road. Jesus can still make you clean. “Or do you not know that the unrighteous will not inherit the kingdom of God? Do not be deceived; neither fornicators, nor idolaters, nor adulterers, nor effeminate, nor homosexuals, nor thieves, nor the covetous, nor drunkards, nor revilers, nor swindlers, will inherit the kingdom of God. Such were some of you; but you were washed, but you were sanctified, [made holy] but you were justified [declared right before God] in the name of the Lord Jesus Christ and in the Spirit of our God” (1 Corinthians 6:9–11). Thank you for the fantastic article! The best thing I have ever done is give my life to Christ! My joy is full and overflowing!